Price FP-868 is £3.95, while FP 874 is £3.95. The Type A1 roundel is a common variety used in the early years of the war. This had the standard spacing roundels with large yellow surrounds. These were mostly used on the fuselage sides as an identification marking. For modelers, these added a considerable amount of color to what many think was a rather drab scheme. Fantasy Printshop has these decals in the two major scales. FP874 is 1/72 and FP 868 is 1/48. There are two sizes on each sheet: 49 " and 35". 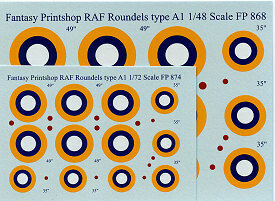 Printing is superb with very small carriers and separate center dots to assure proper registration.